OSWEGO – Oswego Health, which consistently advocates for residents to improve their health status through programs and educational materials, has itself been recognized by a national wellness company for the health of its employees. Oswego Health is being honored as one of the healthiest companies in America by Interactive Health. 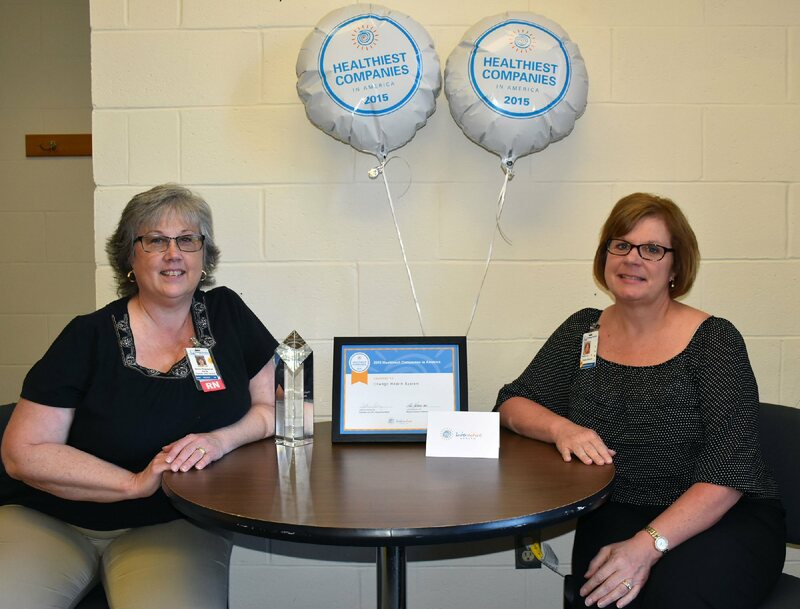 Pictured with Oswego Health’s award and certificate, from left, Mary Bucher, RN, of Oswego Health’s Employee Health, and Wellness Department and Mary Jo Stevens, Oswego Health Director of Benefits. The health system is being honored as one of the healthiest companies in America by Interactive Health, a national leader known for its personalized wellness solutions. Oswego Health is one of 154 companies across the country being recognized for helping employees make significant and sometimes life-saving changes to improve their health. Interactive Health provides wellness programs to approximately 2,000 companies across the country, which represents a range of professions. Staff members utilizing the company offered health insurance plan developed personal health scores based upon health screenings and their health-related habits. According to a report compiled by Interactive Health, Oswego Health staff members found to have conditions such as high blood pressure or high levels of cholesterol and glucose, among others, took advantage of health programs and resources to improve their health. Oswego Health has been a part of Interactive Health, an Excellus Blue 4 U initiative for two years. Through the dedication of its staff, this is the first year that the health system has been named among the healthiest companies in America.